Making learning hands on is so important to me. For this reason I tend to make A LOT of play dough. My students love to make their words with play dough and I use play dough for numerous Social Studies and Science activities. This week, I made SPACE DOUGH. When it is finished, store it in an sealed container and it will last for up to 6 months! When you add your scents (or extracts) make sure you add it in with the liquid in the beginning. A little goes a long way. So, don’t use a half of a bottle to make peppermint play dough like I did by accident one year…. The whole house smelled like peppermints…for a few days. WOOPS! I have found that a teaspoon of scent is good! When making it for my classroom, I always double the recipe and it makes enough for around 10-12 kids. As I said, I’ve made A LOT of play dough so… I’ve made a lot of mistakes. Here’s what you should NOT do. Now, for the SPACE play dough I added a whole quarter of the bottle of black food coloring (because I wanted it to be super black). 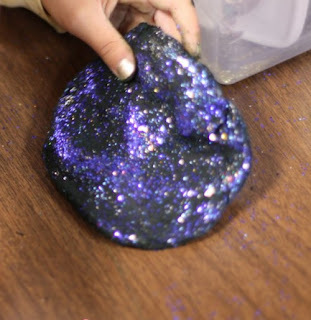 In school I am going to give each student a ball of space, a small container or glitter, star beads, a yellow big bead, a blue bead and a gray bead. We are going to create the night sky in our play dough by adding galaxies (the glitter), the sun (The yellow bead), the Earth (the blue bead), and the moon (the gray bead.) I will have them make their moons ORBIT the Earth and the Earth ORBIT the sun. This will be a fun hands on lesson to introduce my explorers to SPACE. Pictures to come! I hope your play dough comes out amazing! Oh, by the way, it takes only 10 minutes from start to finish to make homemade play dough!! This playdoh recipe looks fantastic! I cannot wait to see the pictures from the class. I have been wanting to make playdoh with jello too. I have even heard you can use the new frosting creations packets and they turn out great! They have flavors like cotton candy! Yum! I will HAVE to try making some with those frosting packets!! Thanks for the tip! !